These delusions obscure our true nature, but through spiritual practice they can be transformed into the wisdom of these five respective Buddhas. White Vairocana The delusion of ignorance becomes the wisdom of reality. Yellow Ratnasambhava The delusion of pride becomes the wisdom of sameness. Red Amitabha The delusion of attachment becomes the wisdom of discernment. Green Amoghasiddhi The delusion of jealousy becomes the wisdom of accomplishment. Blue Akshobhya The delusion of anger becomes the mirror like wisdom. these hymns, whose sacred sounds contained the genetic patterns of beings and things, so there is already a clear sense of mandala as world-model. subject dichotomy. 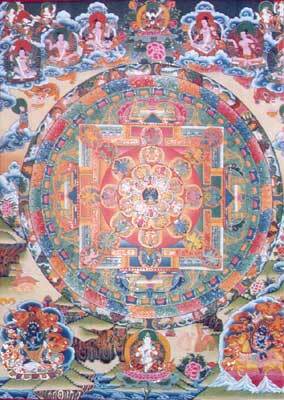 In the process, the mandala is consecrated to a deity. 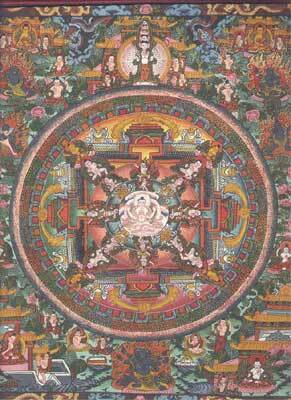 its complete picture a mandala means grasping the essence. undergo a long period of technical artistic training and memorization, learning how to draw all the various symbols and studying related philosophical concepts. At the Namgyal monastery (the personal monastery of the Dalai lama), for example, this period is three years. boundless thoughts namely - loving kindness, compassion, sympathy, and equanimity. Each of these gateways is adorned with bells, garlands and other decorative items. This square form defines the architecture of the mandala described as a four-sided palace or temple. A palace because it is the residence of the presiding deity of the mandala, a temple because it contains the essence of the Buddha. they assume a purely benevolent guise. 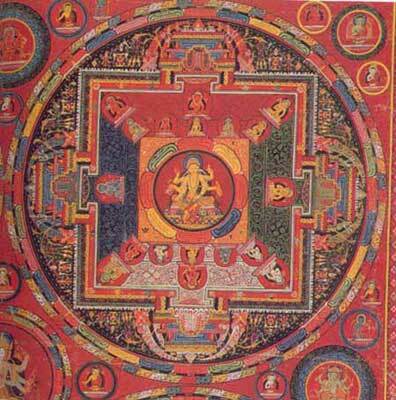 If form is crucial to the mandala, so too is color. The quadrants of the mandala-palace are typically divided into isosceles triangles of color, including four of the following five: white, yellow, red, green and dark blue. Each of these colors is associated with one of the five transcendental Buddhas, further associated with the five delusions of human nature. These delusions obscure our true nature, but through spiritual practice they can be transformed into the wisdom of these five respective Buddhas. there being no readily available materials with which to construct a mandala, Naropa urinated on the sand and formed an offering of a wet-sand mandala. On another occasion Naropa used his blood, head, and limbs to create a mandala offering for his guru, who was delighted with these spontaneous offerings. suffering, to attain enlightenment and to attain a correct view of Reality. It is a means to discover divinity by the realization that it resides within one's own self. Question: A crafts person wished to use the HUM syllable in a craft piece, and for a good example thereof. What are the proper colours for the five elements of it? I believe the place where I once saw these described was at the back of Lama Govinda's Foundations of Tibetan Mysticism. As I recall, the bindu at the top was blue, the crescent yellow, the elements below that white, red and green, but I'm not sure about the order. Answer (by Christa): Within seconds I received a message to turn to pages 334-340 in 'Tibetan Yoga & Secret Doctrines' edited by W.Y. Evans-Wentz, a book my Teacher (Rama) emphasized a great deal. 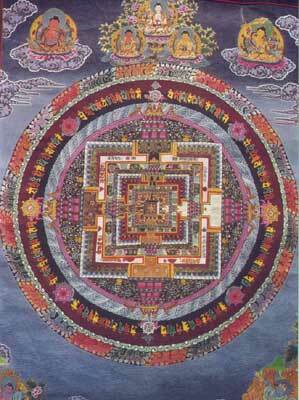 The colors of the Long Hum mantra correspond to the Five Dhyani Buddhas which correspond to the Five Wisdoms. "As in the Tibetan Book of the Dead, to which serious readers should refer for further explication, the Essential, or Foundation, Wisdom is the All-Pervading Wisdom of the Dharma-Dhatu ('Seed, or Potentiality, of Truth'), or the Wisdom born of the Dharma-Kaya ('Divine Body of Truth'), in its aspect as the All-Pervading Voidness. The Dharma-Dhatu is symbolized by the Aggregate of Matter, whence spring all physical forms, animate and inanimate, visible and invisible. The Dharma-Dhatu, being the Thatness constituting the Dharma-Kaya, is personified by the Chief of the Dhyani Buddhas, Vairchana. Freedom, for his is nevermore to return to the Kingdom of Ignorance and Illusion save as a Bodhisattva, vowed to selflessness, to guide those who still dwell in the Darkness of the Cave to the Light of Day. The Mirror-like Wisdom, personified by the Dhyani Buddha Akshobhya, of whom the Dhyani Buddha Vajra-Sattva is the Sambhoga-Kaya reflex, confers the siddhi (or yogic power) of seeing clairvoyantly the innate reality reflected, as in a mirror, in all phenomenal or apparent things, organic and inorganic. As with a telescope or microscope men of science study the Universe externally in its unreality, so with the yogic insight conferred by the Mirror-like Wisdom the master of this yoga studies the Universe internally in its True State. Through having realized the Wisdom of Equality, personified by the Dhyani Buddha Ratna-Sambhava, the yogin sees all things with divine impartiality, invirtue of the yoga of equal-mindedness. The Discriminating Wisdom, personified by the Dhyani Buddha Amitabha, confers the yogic power of knowing each thing by itself and, also, all things as the One. The fifth, the All-Perfecting Wisdom, personified by the Dhyani Buddha Amogha-Siddhi, confers power of perseverance, essential to success in all yogas, and infallible judgement with consequent unerring action. 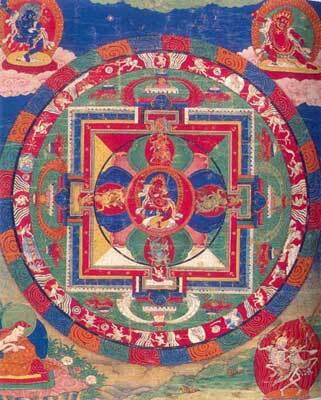 of manifestation the Element Air, is the source of the breath of life. personified by the Dhyani Buddha Vajrasattva, and related, in a comparative way, with the Mirror-like Wisdom. Vajra-Sattva, in this esoteric relation, is synonymous with Samanta-Bhadra, the Adi (i.e. Primordial) Buddha, personification of the Unborn, Unshaped, Unmodified Dharma-Kaya, or Nirvana. Samanta-Bhadra, in turn, is frequently personified in Vairochana, the Chief of the Five Dhyani Buddhas. With the Dharma-Dhatu Wisdom, Stupidity (or Sloth, or Delusion), the Aggregate of Matter, the deva world (or worlds), and the colour blue; with the Mirror-like Wisdom, Anger, the Aggregate of Consciousness, the hell world (or worlds), and the colour white; with the Wisdom of Equality, Egotism (or Pride, or, as in the quaotation on the page facing the Preface herein, Selfishness,) the Aggregate of Touch, the human world, and the colour yellow; with the Discriminating Wisdom, Lust (or Greed), the Aggregate of Feelings (or Attachment), the ghost world, and the colour red; and with the All-Perfecting (or All-Performing) Wisdom, Jealousy, the Aggregate of Volition, the titan world, and the colour green. 1) The Acuminated Circle [tapering in flame into Space, symbolizeth] Vairochana, [as personifying] the Dharma-Dhatu Wisdom. 2) The Crescent [symbolizeth] Akshobhya, [as personifying] the Mirror-like Wisdom. 3)The Top-Portion (the single horizontal stroke the crescent rests upon) [symbolizeth] Ratna-Sambhava, [as personifying] the Wisdom of Equality. 5) The [Silent] HA together with the Vowel-Sign are Amogha-Siddhi, [as personifying] the All-Perfecting Wisdom. 6) The HUM [thus] compriseth [in its symbolism] the Nature [or Essence] of the Five Orders [of the Buddhas of Meditation]. wisdom] which accomplisheth all works; the body of the letter H, for the knowledge which distinguisheth; the top of the letter H, for the equalizing knowledge; the Crescent [Chandra, the Moon], for the mirror-like knowledge; and the Bindu [Thigle, the Acuminated Circle], above that, for the changless knowledge. Mental concentration upon these various parts of the Mantra, symbolizing Mind, is the means whereby mind [in its unenlightened condition] is fitted for contemplation on the Bliss of the Divine [or Supramundane] Mind.'" Each of the Five Wisdoms/Aggregates are inherently empty, self-liberated and pure, which is why they're each identified with both a wisdom & a poison.